The San Carlo pizza from a few weeks ago holds a special place in the old ticker here at Eating The North. Misty of eye and lump of the throat go we at that dear memory. 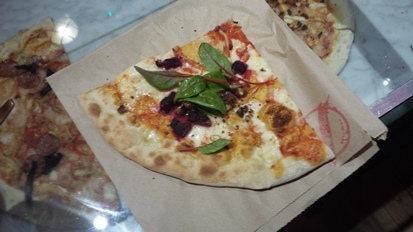 Advised that equally good pizza can be found at Belgrave Music Hall, rustled up by Dough Boys, and that there are regular offers on to get it at half price, a Leeds pilgrimage was hastily arranged. A quick pit-stop at Whitelocks helped to whet the appetite. Liquid refreshment was taken and the food menu perused for a future visit. From that cosiest of pubs at the bottom of town, to the scruffier part at the top (that looks a bit like Bradford but with fashionable eating and drinking dens dotted about), we land at the neon-signed Belgrave Music Hall and are soon eyeing up the goods like a 6th Former in Amsterdam. Let’s get to the point. 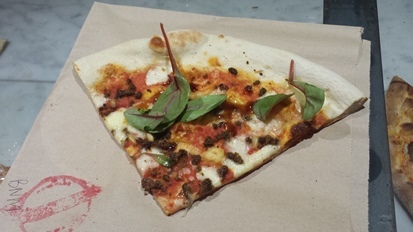 Was the Dough Boys pizza as good as San Carlo? Although we class ourselves as traditionalists (middle class klaxon) we can say only that we were dazzled by the bright lights of a big city and so ordered the Screaming Goat; creamed goats cheese, roasted beetroot, caramelised walnuts and chervil. Despite the sweetness (bit too much for us) the signs of Good Pizza were all there. Whilst this was being despatched out came a couple of others; the Baa No More (spiced ground lamb, pine nuts, pomegranate) and the self explanatory Sausage Fest (titter). There was pungent cinnamon with the lamb and earthy black pepper sausage on t’other. Both of these were on the upward trajectory to Very Good Pizza. We laced it with garlic oil and got to work, and Very Good Pizza became Very Good Pizza Indeed: a thin, charred base with burst air pockets; creamy mozzarella (and not too much of it) with fresh basil. 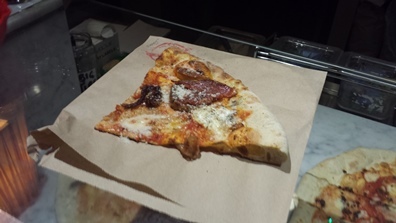 Simplicity had landed us in San Carlo territory, and at £1 a slice. The heart fluttered. (That may have been the Hot Bstrd sauce we doused on the sausage). Other than personal taste the only real downer was that they were a touch tepid; they’re made in advance and reheated to order and could probably do with a longer blast in the oven. In fairness the usual pizza-people were away. Perhaps they serve them hotter. But the pros undoubtedly outweigh that particular con, and at the prices we paid the slices were a steal. In what universe can reheated pizza possibly be described as “very good indeed”? I think you need to have a quiet word with yourself. Kris, it is not re-heated, rather finished off. They are only part cooked when on display and then given a final go over in the oven. Try it for yourself, it certainly is ‘very good’.